Which Performance Features Will You Choose With the Chrysler 300? | South 20 Dodge Chrysler Ltd. Which Performance Features Will You Choose With the Chrysler 300? Has the Chrysler 300 caught your attention? At South 20 Dodge Chrysler Ltd., it is a popular full-size luxury sedan because it comes with many features that provide you with efficiency and power. Let's check out a few of its performance features. The two engines that power the Chrysler 300 are the 3.6L Pentastar V6 and the 5.7L HEMI V8. The award-winning 3.6L Pentastar engine is coupled with an eight-speed automatic transmission that gives you a highway fuel economy of 7.8 L/100 km. 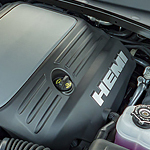 The 5.7L HEMI V8 engine comes equipped with best-in-class horsepower and Fuel Saver Technology. This engine can reach 363 horsepower and 394 lb.-ft. of torque. Fuel Saver Technology enhances efficiency because it can deactivate four of the eight cylinders when needed. The available all-wheel-drive system is another performance feature that comes with the Chrysler 300. This feature can automatically engage at any speed to provide you with optimal traction and control by adjusting to your driving style and road conditions.